To the filling, I just added whatever that looked harmless. Other than ground meat and minced onion, I threw in chopped cashew nuts, dried cranberry, minced shimeji mushrooms, AND some cooked rice. I guess most Japanese people do not put rice in a cabbage roll, but I decided to give it a try after finding so many cabbage roll recipes calling for cooked/uncooked rice as an ingredient. I didn’t feel like using the sticky short-grain rice for this, so I cooked some long-grain rice and mixed in to the filling. Of course I used the chicken stock from the other day for the soup and added some canned tomato puree. 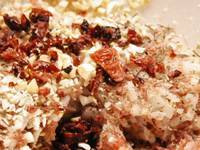 Some bacon strips were used to add more flavor. It was gooooooooood. Next time I might use more herbs in addition to the thyme and parsley I used today. My last attempt to make a dessert out of my dad’s purple sweet potatoes was not a great success. 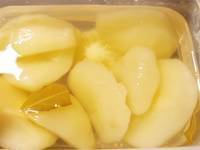 Since then, I had been thinking that condensed milk might improve the taste of these rather tasteless sweet potatoes. So, being inspired by the recent sweet potato pie posts by Dennis and JMom, I went for another experiment yesterday. 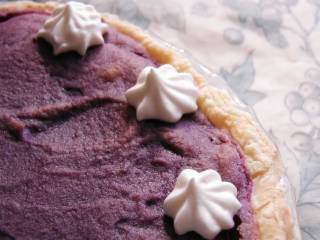 I made purple sweet potato pie. Basically I followed the recipe that JMom posted, but since the texture of my potatoes was different from regular sweet potatoes, I omitted the flour and changed the amount of milk. And I added some condensed milk, the key ingredient of the experiment this time. Usually I love the combination of sweet potatoes and cinnamon, but with this particular kind of sweet potatoes, I felt differently. So I just added a small amount of nutmeg and allspice. The only thing is that I made this pie yesterday, but garnished/took photos today. So in the photo, the pie doesn’t look as good as it did yesterday. I should have taken a photo right after it came out of the oven! I really wanted to show you the beautiful purple color!! In Japan, November 23rd is Labor Thanksgiving Day. (Its origin is explained here.) Unfortunately, the fact is that most of us do not know how it started and do not really do anything to thank the labor of all Japanese workers. There’s no special food to celebrate this holiday, except that recently a Japanese food company started a TV commercial saying “Let’s cook curry for dad on labor thanksgiving day to thank him for his labor” or something along that line. Now, finding a turkey around here is out of question, and even one whole chicken is hard to find. 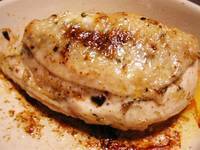 So I was very happy when I found a recipe of roasted chicken breasts on the net last year. Of course I needed to downsize it and make some changes, but basically I’m very happy with this recipe. This year I added some chestnuts and quite a lot of thyme from my balcony garden to the filling, and it worked wonderfully. I only used red wine for the sauce, but still it was OK. To be honest, the cornbread wasn’t such a great success this year, because I threw in some leftover sour cream and it made the bread quite heavy. was not bad at all. (Yes, I made the apple pie myself.) 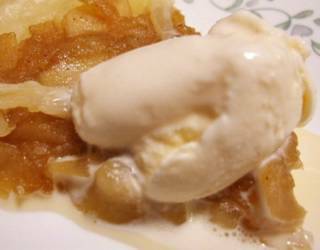 The warm apple pie and vanilla ice cream! What a heavenly combination! Thanksgiving does give me a perfect opportunity (excuse?) to stuff myself with food, but that’s not the only reason why I keep that custom here. I do so to re-visit the good memories America gave me while I was there. It’s like thanking that country for giving me so many experiences, both good and bad, that I couldn’t have had in Japan. 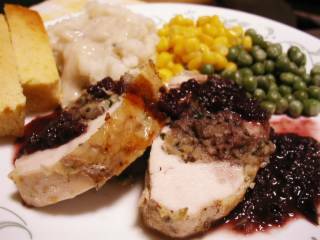 Unfortunately, I have no one here to share my nostalgia for American Thanksgiving. Looks like some people I know here see me as a too-Americanized woman showing off her experiences in another country. So I learned that it’s safer to celebrate it alone at least until I find someone here who shares the same kind of nostalgia. This year, it’s different, though. I have bunch of my blogmates to share this experience with, and it really makes me happy!! Here comes the dish which used to provoke a controversy between some of my American friends and me. 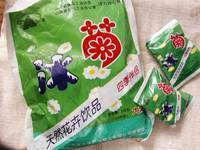 This is Japanese kids’ favorite, and as an adult now, I still crave for this every now and then. It’s called omuraisu --- omu from “omelet” and raisu from “rice.” This is basically fried rice (most often, with tiny chicken pieces and chopped onion) seasoned with salt+pepper and ketchup and wrapped in a thin sweet omelet. I found an interesting thread (to me, at least) on this omuraisu issue. Gee, foodblogging has really broadened my horizons, and still is. Until I read this thread, I thought all Americans were ketchup freaks!! Anyway, back to omuraisu. I, of course, don’t mean to force people to eat or love omuraisu, but I just want to say that it’s not as bad as just eating cooked white rice with ketchup poured on top, if that’s what you think it is. As someone said in the above forum, the rice is cooked with other things (usually chicken and onion) and it really makes a difference. For those who don’t like ketchup on top, demiglace sauce is another choice. At the Izakaya pub where I work, they use both ketchup and demiglace. 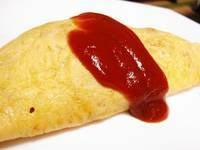 Traditionally, the ketchp-flavored fried rice is wrapped with a thin omelet, but recently some make a soft, thicker omelet and cut it open on top of a heap of ketchup rice. For that type of omuraisu, I prefer demiglace sauce. Well, sorry if I hurt your feeling by posting about something you consider yucky, but just for those who love omuraisu like I do, here’s another pic. Whoops! Sorry, I posted a bigger one ! Another interesting site I found about omuraisu. (Sorry, in Japanese, but see photos.) 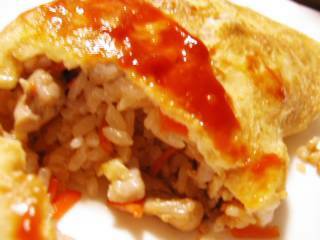 Hey, omuraisu lovers, check this out! 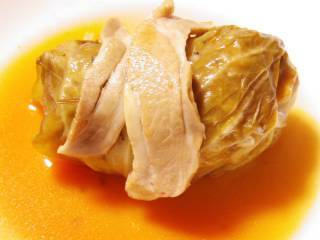 Now my ambition is making nice and warm cabbage roll ASA I find a cabbage that’s not too expensive. I guess the worst time is already over, but still vegetables are so expensive in Japan (because of the typhoons we had this year). Anyway, for the future “cabbage-roll dinner night,” I made chicken stock today and froze it. Whenever I make chicken stock, the fragrance of herbs from the pot fills my small apartment rooms and makes me feel so relaxed. It’s pretty therapeutic, isn’t it? I’ve been working hard to use the vegs and fruits I brought from my parents’ house last weekend. and I pureed and froze the purple sweet potatoes. 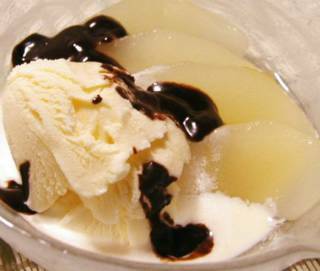 So I just had a break and tried the compote with ice cream & chocolate. My blueberry, Sunshine blue started blooming. 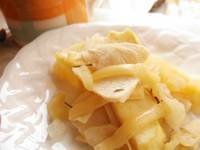 - Cut daikon in to apx. 1/2 inch-thick pieces and peel. 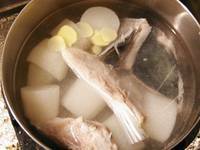 If time allows, do this “preparation” to make daikon tastier and reduce the fishy smell of yellowtail. 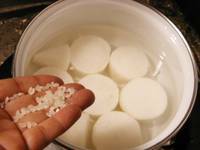 (* Preparation: Boil daikon pieces with a pinch of raw rice until they start looking a little transparent. Wash rice off with water and drain. - Add sugar, soy sauce and mirin. 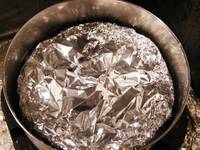 Simmer for 25 to 30 min with otoshi-buta or aluminum foil on top. * If time allows, take off from heat and cool completely, then re-heat just before serving. The process marked with “*” does make a difference, so I strongly recommend not to skip them if time allows. Otoshi-buta (drop-lid) has this benefit. 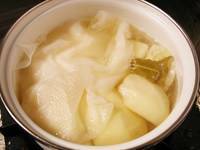 They say that boiling daikon with rice takes bitterness away and make daikon softer so that it can absorb seasoning well. 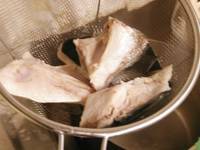 It’s also said that simmered foods absorb seasoning the most while they cool down. So I’d rather go for lighter soup (using less seasoning) + cooling process than simmering in strong soup and eating right away. 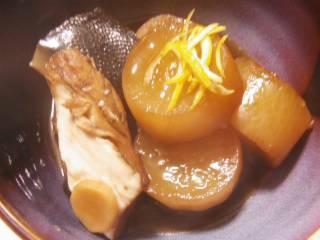 The buri-daikon I made today was a GREAT success mainly because both buri and daikon were very fresh. 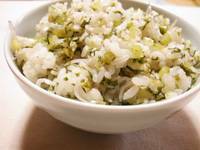 The daikon leaves were minced, seasoned and mixed with rice. Ahh…… I’m so full and satisfied. Hmmmmmm………………. I visited my parents’ last weekend and brought back some fruits and vegetables (as usual) ;) The La France pears were a present from a friend of my mom’s, I think. The purple sweet potatoes and lemons (believe it or not, these are lemons grown right next to orange trees!!) are from my dad’s veg. garden and orchard. Actually, the photo shows only part of them... I brought 5 or 6 of each kind. 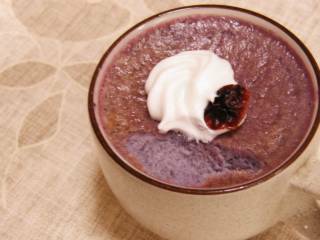 The first thing I made was purple sweet potato pudding. This was kind of disappointing. 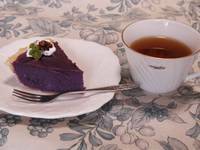 I had store-bought purple sweet potato pudding many times before and loved them sooooo much. 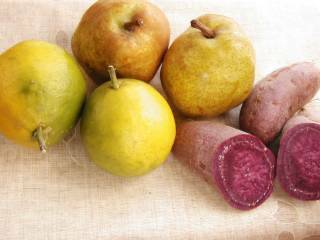 In addition to the bright purple color, I always enjoyed their sweetness which is somewhat different from regular sweet potatoes. 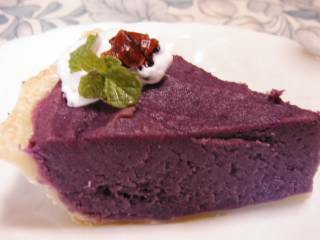 So I was very excited to make pudding out of the purple sweet potatoes myself, but it turned out almost totally tasteless!!! 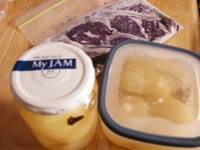 * Later, I made syrup (water, honey and a little orange curacao) and tried it with the pudding. It helped more than I expected. Actually, it was pretty good :) The orange curacao didn't kill the flavor of the purple potatoes like I was worried about. So, now I can say that today’s experiment was satisfactory. These two newcomers joined my balcony garden today. 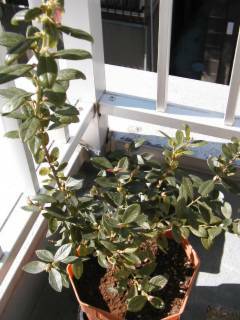 “Sunshine blue” (Blueberry) … Already has many flower buds…. 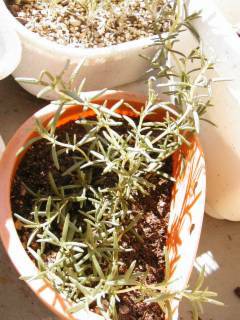 This one is said to be semi-evergreen and semi-dwarf type. I didn’t expect to find this kind around here, so I almost jumped with joy when I accidentally found one at a shop not too far from my place but somehow I've never visited before. What we commonly say about persimmons as a rule of thumb here is: The flatter ones are sweet, acorn-shaped ones are bitter. 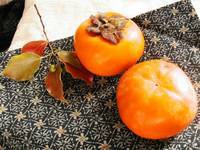 The sweet (non-astringent) kind persimmons like the Fuyu and CoffeCake shown here taste sweet while they are still firm, so you don’t have to wait until they get really soft. To eat the bitter (astringent) ones, you either wait until they get very ripe and soft, or take the bitterness out by sun-drying or using distilled spirit. 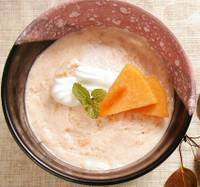 I mentioned about eating a bitter persimmon with mayonnaise, but that’s not what we commonly do here in Japan. It was just an interesting finding reported on TV. They said that when you eat a bitter persimmon, it takes away the protein in your mouth and that makes you feel the bitter taste. When eaten with mayonnaise, the mayonnaise supplies the protein to make up for what’s lost and that’s why you don’t feel bitterness. I don’t know if it’s a scientifically proven finding, nor I tried eating one that way myself, but I just remembered the information. * Sorry, I fixed the amount of miso in the miso-soup recipe. Yesterday was my complete day off after the busiest week of the month. It was a perfect excuse to open the bottle of Chablis that my aunt gave me last summer. I made fish meuniere and crispy lettuce & tomato salad for dinner and enjoyed them with the Chablis. 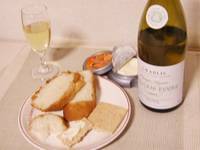 After dinner, I had some more of the wine with slices of buttered French bread and cream cheese on whole-wheat crackers, and they were sooooooo good that I kept going on and on….. When I woke up this morning, my whole body told me to make today a NO-butter day. So instead of the Western-style breakfast with toast, I had a Japanese breakfast. Boil water in a pot. Add dashi powder and tofu and bring to boil. Turn the heat low and add miso. 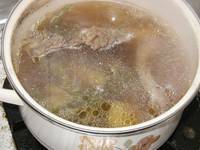 Trun the heat to medium-high just briefly --- do not boil too much after miso is added. As you probably noticed, this is an easy way out. 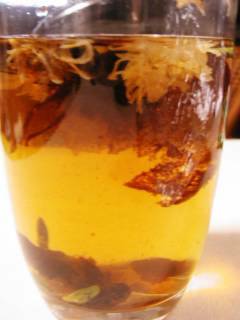 It takes longer but tastes much better if you made dashi stock from scratch using dried bonito flakes and/or kelp. 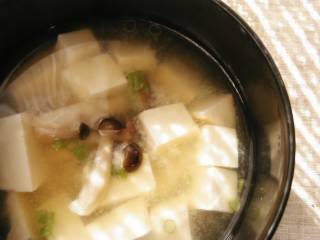 BTW, I seldom make miso soup with tofu only; I usually add something like wakame kelp, potatoes or daikon, etc. Today I put some shimeji mushrooms that were left in the fridge. Now, this is something you shouldn’t do when you’re eating out or invited to your Japanese friend’s house. 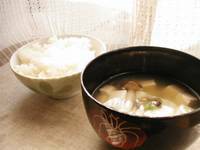 When they are served in separate bowls, pouring miso soup over rice is basically a bad manner. 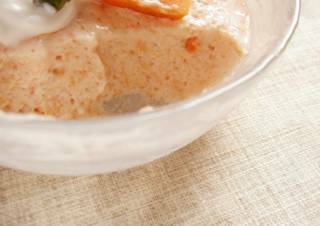 Unless it’s a local special cuisine like hiyajiru (cold miso soup poured over rice) in some areas, it’s safer you don’t do that when you are with someone who is not your family member, at least until you become close friends with the person. It actually tastes very good, though…. Or maybe I feel so because of the way I was brought up. In my hometown, one way to use the leftover cold rice is to put it in leftover miso soup and simmer to make porridge. It’s very good especially when you add a beaten egg at the end and simmer just a little – it gives extra body and makes the miso taste milder. 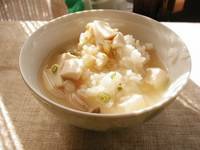 Actually my mom gave me and my sister the "miso soup porridge" as baby food (the soup was thinned down quite a bit for babies), and maybe that’s why I feel so attached to the taste of rice-miso soup mixture. And I promise not to have butter all day today!! 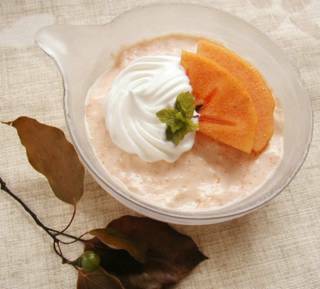 Guess what fruit I used to make this mousse. - Typical autumn fruit in Japan. sweet kind and bitter kind. warm in a plastic bag. you don’t feel the bitterness. 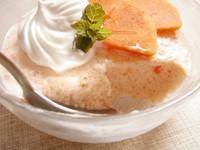 The taste of this mousse? Rather light and smooth. Very good with whipped cream. Next time, I’m thinking about making thick and sweet sauce out of this fruit to pour over the mousse. OsloFoodie’s recent post about wild rosehips and chrysanthemum tea reminded me that my friend gave me some instant chrysanthemum tea a few years ago. It was a souvenir from China, and I thought there might be a few packages left somewhere in the kitchen. I was right. I found 4 individual packages left in the cupboard. 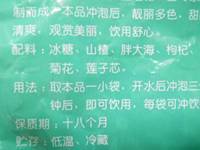 Anyway, guessing from some Chinese characters I can understand on the package, this seems to contain healthy things like hawthorn, wolfberry and lotus seeds(??) 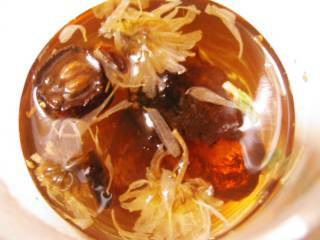 in addition to dried chrysanthemum, but I’m not sure. Can someone help me with Chinese? What are the ingredients? 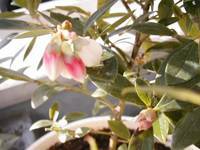 I truly loved its soothing fragrance and mild sweetness. Looks like I stored the 4 packages in a can when those were the only ones left, and completely forgot about it. Now I don’t think they’re good any more, but I opened one and made the drink just to show you how it looks like. I wonder if this instant drink is popular in other Asian countries. Is it? Maybe it wasn’t a smart thing to do, but I had a double cheeseburger before work tonight. When I got out of work, I felt hungry again, but didn’t want to eat anything greasy. So my choice for the very late supper was something quick & hot, and easy on my stomach. 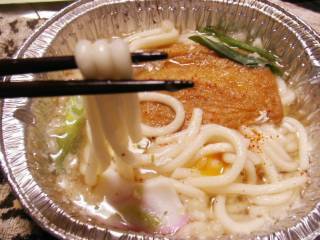 It’s called nabeyaki-udon. Nabeyaki means “heated in a pot (I guess).” Generally udon is served in a bowl, but when in Nabeyaki style, usually one serving of udon is heated in a small clay pot and served as it is in the pot. This way you can eat udon noodles hot, still boiling in the pot when served. It’s something really nice to have on a cold winter night. 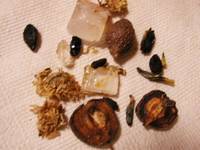 The aburage is seasoned sweet, and it tastes very good with the soy-sauce based udon soup. Usually I add more vegetables, but tonight I got really lazy. 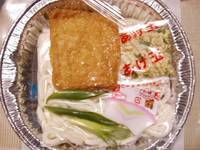 A bowl of udon with aburage is called kitsune(fox) udon, maybe because the light brown aburage resembles a fox. 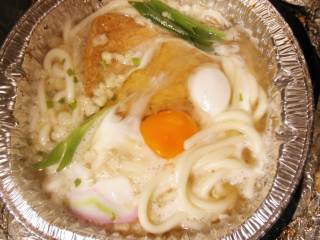 If an egg is added, it is called tsukimi (moon-viewing) udon, obviously because the eggyolk looks like a full-moon. So in my nabeyaki-udon tonight, a fox was enjoying the view of the full-moon. Pretty poetic, isn’t it? Sweet Potato & Apple Bake...or something like that. This was something totally new to me. The apple I bought the other day needed to be used ASAP. 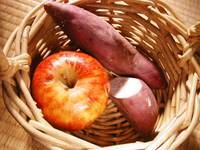 I also wanted to consume the sweet potatoes I still had left from the tempra day. 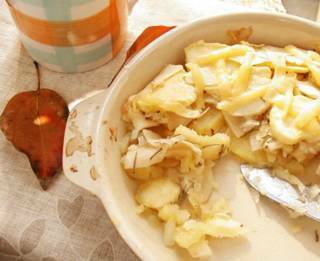 After a little net search for a recipe that uses both apples and sweet potatoes (I tried to avoid pies), I came across this recipe . The taste was OK, but would have been a lot better with sharp cheddar cheese. 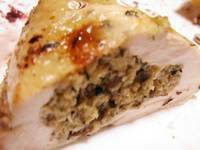 I’ll try this recipe again someday with a little modification and definitely with cheddar cheese on top. Or whatever the name is. This is my favorite and really easy to make. 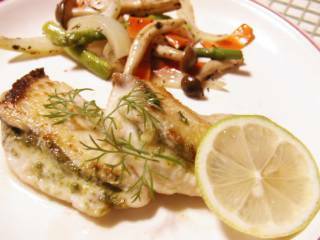 The basil paste inside gave enough flavor so I didn’t even need to salt & pepper the shiira (dolphin fish or dorado) fillet. (I soaked the fillet in white wine briefly beforehand.) To make the sauce, I just poured some white wine into the frying pan right after I took out the fillet, and added a squeeze of lemon. That was it. 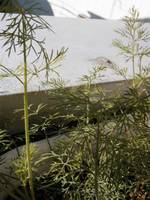 The dill is from my balcony garden. They are this big now. BTW, I made a pop quiz out of my previous tempra photo just to get you to take a closer look at it. Wanna try? Choose 2 ingredients that are not included in the tempra.